Woods, along with Zach Johnson (11th in Ryder Cup standings), Stewart Cink (14th) and Rickie Fowler (20th), managed to make enough of an impression on Pavin to have their names called. This will be Johnson’s second Ryder Cup. Cink’s fourth. Fowler will be a rookie. Woods will not. 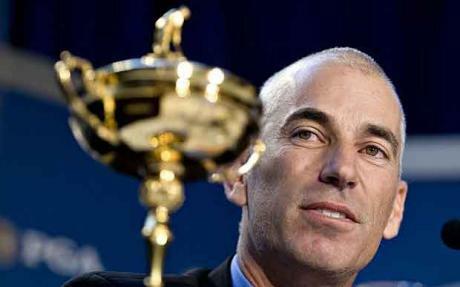 But, for a couple of big reasons, Corey Pavin will regret naming Tiger to the team. Since returning to the game at the 2010 Masters, Tiger Woods has just two top-ten finishes in 11 PGA TOUR events. So how will he play at the Ryder Cup next month? The 2010 Ryder Cup, at Celtic Manor in Wales from October 1-3, will be Woods’ sixth opportunity to represent his country at golf’s biggest team showcase. In those previous five Matches, Woods a losing record: 10-13-2. His record in singles, where he should shine, is 3-1-1. But, in foursomes and four-ball, it’s impossible to find someone to pair him with. I watched Captain Hal Sutton find that out first hand in 2004 at Oakland Hills. At the opening ceremonies, Sutton stood up, puffed out his chest and announced that he’d put together an “All-Star” pairing of Woods and Phil Mickelson for Friday morning. Problem is that Phil is such a flake, we all watched him drive Tiger nuts. Sutton ended up looking like a buffoon and Tiger looked like a rudderless dingy. There is absolutely no reason to believe Tiger will bring his A-game to Wales. Not even sure if he still has an A-game. By comparison, Jack Nicklaus’ Ryder Cup record, in six appearances, was 17-8-3. Arnold Palmer, also in six Ryder Cups, was 22-8-2. If you are interested, Billy Casper, Raymond Floyd and Lanny Wadkins have all played in eight Ryder Cup Matches. Phil Mickelson will tie their high-water mark at Celtic Manor. Phil can play with anyone. Tiger cannot. What it boils down to is whether or not Corey’s boys can overcome the presence of Tiger and spank the Europeans again – like they did under Paul Azinger at Valhalla two autumns ago. Ryder-Cup veterans on the squad include Mickelson (1st in Ryder Cup points), Woods (12th), Hunter Mahan (2nd), Jim Furyk (4th), Steve Stricker (5th), Zach Johnson and Stewart Cink. There will be five Ryder-Cup rookies: Rickey Fowler, Bubba Watson (3rd), Dustin Johnson (6th), Matt Kuchar (8th) and Jeff Overton (7th). That’s a good mix. Seven vets. Five rookies. Two years ago, Azinger had six rookies at his disposal. Pavin’s other giant question mark, besides Woods, is Dustin Johnson. Primarily because the Ryder Cup is pressure. In fact, it’s nothing but pressure. Any player who’s ever teed it up for his or her country will tell you that. How did Dustin Johnson do this year under pressure? Well, let’s see…he led the United States Open after 54 holes…then fired an 82. Worst final round by a U.S. Open leader since 1412, or thereabouts. Then, at the PGA Championship, all old Dustin needed was a bogey at the last to qualify for a playoff. He took five swings at the ball on Whistling Straits’ 18th but, because he was too lazy/slow-witted to read a rules sheet that had been given to all players before the event, he ended up with a two-shot penalty for soling his club in a bunker. Good luck, Corey. Well, I guess you could rest him until the Sunday Singles. Might make some sense. 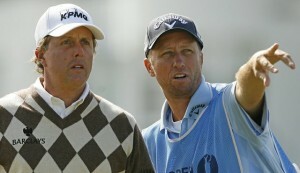 Phil Mickelson, with caddy "Bones" Mackay at 2010 Open Championship, made his first Ryder Cup appearance in 1995 at Oak Hill. That year, he was a rookie teammate of this year's captain, Corey Pavin. It will also be interesting to see if Tiger assumes a leadership role, or rolls over and lets big Phil lumber his way to the front of the room. Whether Pavin likes it or not, all eyes will be on Tiger at this year’s Ryder Cup. Who will he be paired with? How will he play? Because it certainly is a different Tiger than the one we’re used to seeing stride to the first tee at the Ryder Cup. As I hit publish, there are exactly 23 days, 20 hours and 7 minutes until the first shot is hit in Wales. Can’t wait.